The Lapponian Herder was bred specifically to herd reindeer in the cold climates of northern Finland. They are one of three closely related reindeer herders from Scandinavia, the others being the Finnish and Swedish Lapphunds. In their homeland, they are called the Lapinporokoira and are still commonly found working reindeer. However, as it gains more recognition both in and outside of Finland it is becoming more common to find them in the role of companion. There is some dispute to the Lapponian Herder’s creation. It is generally accepted that they descend from the Finnish and Swedish Lapphunds, but when they were developed remains unknown. Like the Lapphunds, they were kept by the Sami people, who are indigenous to parts of Finland, Sweden, and Russia. The Sami have been known to keep spitz dogs since antiquity, and been herding reindeer for several centuries. However, it seems unlikely that what in essence is a short coated version of the Lapphund existed before the late 1800s. The invention of motorized vehicles, and later snowmobiles made Sami lands accessible to outsiders and their dogs. Crosses with these breeds introduced the shortened coat. 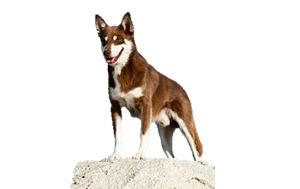 Some sources state the dogs used were from European herding stock, others that the Karelian Bear Dog was added to the bloodline when fanciers were established the Lapphund as a show dog. In reality, there is likely some truth to both theories. Today the Sami still keep Lapponian Herders, and the breed is slowly gaining interest both in Finland and around the world. Is the Lapponian Herder Right for You?